The Anglican Church of Saint Dunstan in High Street, Violet Town was built in 1879 and services have been held continuously since then. A full time Parish Priest lives in Euroa and travels to Violet Town and Longwood – just as has happened through much of the history of the Parish. Violet Town was a parish in its own right for a time and encompassed Dookie and Nalinga churches. St Dunstan’s has conducted many baptisms, weddings and funerals over that time and so has been an important part of Violet Town's history. A magnificently illustrated register in the church lists all the important occasions. St Dunstan's Parish Hall, alongside the church was built in 1904 with the supper room added later. It is a fine original example of a building of this period. It has been the scene of many events and gatherings and a theatre in the 1950s and is once again a place for the local film society to screen movies monthly. The Rectory built in 1910 and the extensive land surrounding it was sold in 2006. New owners have renovated the house and maintained some of its original character. As with so many older buildings, St Dunstan's is in need of restoration. Internal remedial work was undertaken in 2014 to shore up the side walls and buttresses. Repainting has freshened up the interior and new wiring gives better lighting and heating. Fundraising continues for the restoration. A time capsule is buried near the foundation stone and a date to ‘unlock’ its contents is yet to be determined. 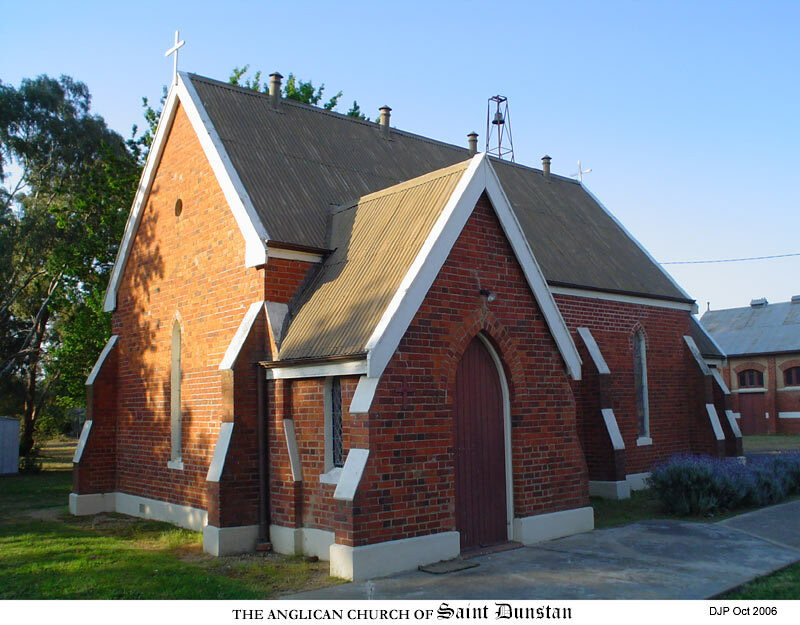 The Church of Saint Dunstan is in the Parish of Euroa in the Diocese of Wangaratta. Visitors, families and friends are always welcome to join us in worship. Music and singing are enjoyed with two excellent organists amongst our congregation.